Height/Weight: 6’ 0” 190 lbs. Past Teams: University of California, Blinn College, Ontario Blue Jays, Canada PG Gold, West Toronto, Rexdale Renegades. Past coaches: Mike Neu, Harvey McIntyre, Dan Bleiwas and Mike Steed, David Quattrociocchi and Raf Choudhury. Drafted: By the Oakland A’s, in the 35th round of 2014 draft, by Oakland scout Matt Higginson (Oakville, Ont.). 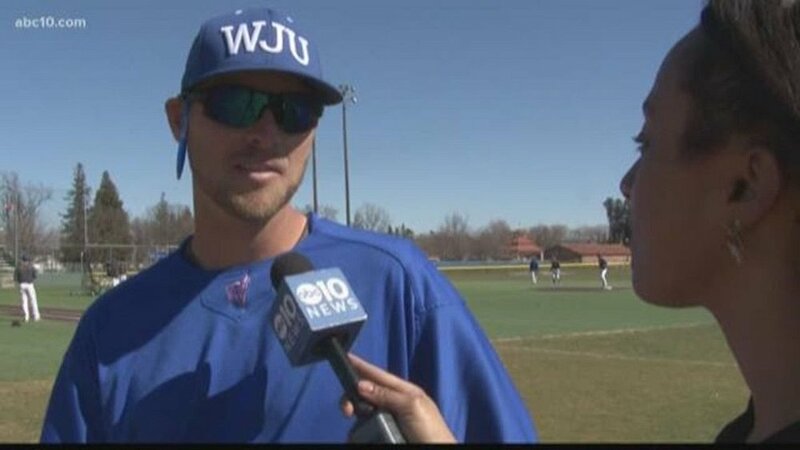 2018 season, at William Jessup as a redshirt sophomore: Hit .365 with seven doubles, three triples, 18 homers and 60 RBIs ... 1.172 OPS in 55 games ... Ranked 8th in North America in homers ... 13th in home runs per game (.327) ... 15th in total bases per game (2.6) ... 18th in runs scored per game (1.218) ... 22nd in total bases (143) and runs scored (67) ... Was 4-for-7 with two homers and three RBIs in season finale loss in NAIA opening round play against Antelope Valley ... Run-scoring single against Judson ... Another game against Judson, another run-scoring single ... Was 2-for-3 with a homer and two RBIs against Hope International ... Run-scoring single against Westmont ... Solo homer facing The Master’s ... Run-scoring single against Menlo ... Solo homer facing Menlo ... RBI triple against Menlo ... Two singles facing Arizona Christian ... Two-run homer facing Arizona Christian ... Two hits, including a homer and two RBIs against Arizona Western ... Single against Westmont ... Six hits in three-game set against Hope International, including a triple, homer and six RBIs ... Three hits, including two homers and three RBIs facing San Diego Christian ... Four hits against the The Master’s ... Two hits, including a double and an RBI facing Vanguard ... Five hits with a double, homer against Menlo ... One hit, one RBI against Arizona Christian ... A homer, three more hits and two RBIs against CSU East Bay ... Three hits with a homer and three RBIs in the three-game Westmont series ... Two homers and a double and three RBIs against CSU East Bay ... Five hits with a triple, a homer and five RBIs against San Diego Christian ... An RBI single against Bethesda ... Six hits, including two doubles, a homer and six RBIs against Hope International ... Was 3-for-3 with two runs knocked in facing Simpson ... Had four hits facing Oregon Tech with a double, two homers and five RBIs ... Had seven hits facing Corban with a double and five RBIs. Honours: 2018 season _ Golden State Conference co-player of the year sharing the honour with Michael Stefanic from Westmont College ... 2014 season _ Preseason Canada/Puerto Rico All Region Second Team All-American ... All Tournament Team at PG High School Showdown-Academies ... 2013 season _ All Tournament Team, WWBA World Championship ... Northeast Top Prospect Showcase ... Showcase Top Prospect List ... Top 10 60 Yd Dash, ranked (3rd of 10) Northeast Top Prospect Showcase ... Top 10 Outfield Velocity, ranked (8th of 10) Northeast Top Prospect Showcase Sub 7 Sixty, 6.75 sec. Aug 9. Summer of 2017 with Lincoln Potters in the Great West League: Batted .310 with 11 doubles, four homers and 39 RBIs ... Was 5-for-9 stealing bases. 2017 as a sophomore at University of California Berkley: Batted .073 (1-for-14) in zero starts appearing in 15 games as a pinch-hitter and outfielder for the Bears ... Had a pinch-hit RBI double at Utah. 2016 as a freshman at Blinn College: Hit .353 with nine doubles, two triples, 10 homers and 27 RBIs ... Played in 52 games and had 1.108 OPS, scoring 38 runs ... He drew 31 walks and stole three bases. 2014 season with the Ontario Blue Jays _ 3-for-4 with one RBI, stolen base against FTB Platinum ... Batted .556 (5-for-9) with two RBIs, two stolen bases and a 1.192 OPS. 2013 season with the Ontario Blue Jays/Canada PG Gold _ Was went 2-3 with a BB, 2 runs and an RBI against the East Cobb Astros ... Doubled and scored facing D-Bat ... Singled against Columbia Blue ... Singled an stole a base against Dulin Dodgers/Rockies Scout Team ... Ran a 6.75 60 and threw 84 mph from outfield Northeast Top Prospect Showcase ... Hit .462 (6-for-13) with a double and an RBI with a 1.026 OPS.